The number of transplants, using organs from both deceased and living donors, increased five percent over 2017. 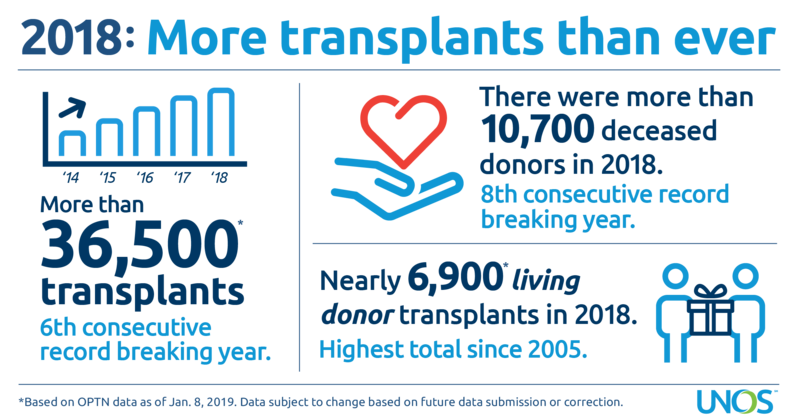 Approximately 81 percent (29,680) of the transplants performed in 2018 involved organs from deceased donors. Living donor transplants accounted for the remaining 19 percent (6,849). The number of living donor transplants represented the highest total since 2005 and increased nearly 11 percent over 2017. In 2018, 10,721 people provided one or more organs for transplantation as deceased organ donors. This was a four percent increase over the 2017 total, and it continues an eight-year trend of record-setting donation. While the number of potential deceased organ donors varies among different areas of the country due to differences in population size and medical characteristics, increases were noted in many areas. Of the 58 organ procurement organizations (OPOs) coordinating deceased organ donation nationwide, 41 (70 percent) experienced an increase in donors from 2017 to 2018, including at least one OPO in each of UNOS’ 11 regions. As in several previous years, some of the increase in deceased donation is due to increased usage of donors with a broader set of medical criteria than was considered in the past. Nearly 20 percent of donors in 2018 donated after circulatory death as opposed to brain death. Nine percent of deceased donor kidney transplants involved organs with a kidney donor profile index (KDPI) score of 86 or higher, which may function less time compared to low KDPI kidney offers but may also shorten the waiting time for transplant candidates. Other donor characteristics setting all-time records in 2018 included an age of 50 or older and/or being identified as having increased risk for blood-borne disease. UNOS, which serves as the Organ Procurement and Transplantation Network (OPTN) under federal contract, continues to provide all services without interruption despite the shutdown of some federal government functions that began December 22, 2018. All UNetSM applications and the donor matching system remain operational, and all UNOS staff will continue to maintain their regular schedules. Should there be any need for an update in the longer term, we will inform you at that time. Thanks to the HIV Organ Policy Equity Act (the HOPE Act), 100 organ transplants have been performed for HIV-positive candidates willing to accept organ offers from HIV-positive donors. As of December 18, 15 hospitals participating in HOPE Act protocols performed those 100 transplants. These include 69 kidney transplants and 31 liver transplants, involving organs from 49 deceased donors. “The collective effort by the transplant community is bringing more opportunity to these patients. As a result, it also expands access for everyone waiting for an organ transplant,” said UNOS Chief Medical Officer David Klassen. Most of the transplants allocated through the HOPE Act have occurred in 2018, as more and more organ procurement organizations have developed recovery protocols. Organs from donors that initially test positive for HIV have been transplanted into HIV-positive recipients since 2016; 19 in 2016, 21 in 2017 and 60 so far in 2018. This indicates that more and more HIV-positive people are becoming aware that they can leave the legacy of life through organ donation. UNOS has been supporting HIV-positive candidates through the HOPE Act since its implementation. “The HOPE act has provided the ability to transplant organs from individuals not previously considered as donors. This has increased the opportunity for HIV+ recipients on the waiting lists to be transplanted,” said Klassen. “The HOPE Act program was slow to get started but in recent months as more transplant centers have initiated HOPE Act transplant programs and OPOs have identified additional donors, the number of transplants has increased substantially.” Signed into law November 2013 and implemented November 2015, the HOPE Act opened the door for HIV-positive candidates to receive and donate organs. The act allows research on transplantation of organs from donors identified as HIV-positive into HIV-positive candidates under approved research protocols. Organ procurement organizations can run matches for HIV-positive donors. The only candidates who appear on match runs for these donor offers are those listed at transplant programs that have an IRB-approved protocol, who are confirmed as HIV-positive, and who are willing to accept an HIV positive kidney or liver. Any participating hospital must conduct transplants under IRB-approved research protocols conforming to the Final Human Immunodeficiency Virus (HIV) Organ Policy Equity (HOPE) Act Safeguards and Research Criteria for Transplantation of Organs Infected with HIV, developed by the National Institute of Allergy and Infectious Diseases, one of the National Institutes of Health. Current estimates suggest that more than 1.2 million people are HIV-positive; 35,000 people are newly infected every year. While life expectancy of HIV positive patients nears that of the general population, end-stage liver or kidney disease is expected to increase as the population ages, creating an even greater need for more organs. It’s critically important to educate HIV patients about the HOPE Act and organ donation if the availability of these organs is to grow. Search for a participating transplant hospital. Transplanting organs from HIV-positive donors into HIV-positive candidates shortens the waitlist, increasing the organ availability from HIV-negative donors for HIV-negative recipients. In addition, it gives hope and comfort to the family of donors, knowing their loved ones have saved the lives of other HIV-positive patients. Chicago – The OPTN/UNOS Liver and Intestinal Organ Transplantation Committee, at its meeting Nov. 2, voted to advance a proposal to revise liver distribution policy for a final vote by the OPTN/UNOS Board of Directors at its Dec. 3-4 meeting. The proposal is intended to establish greater consistency in the geographic areas used to match liver transplant candidates with available organs from most adult deceased donors and reduce geographic differences in liver transplant access. Livers from deceased donors older than age 70, and/or those who die as a result of cardiorespiratory failure, will be exempt from this distribution. Most of these organs are accepted for local candidates, since they are most viable when the preservation time between recovery and transplantation is short. In addition, this distribution sequence would not apply to livers from deceased donors younger than age 18, which are preferentially considered for pediatric transplant candidates. The committee further recommended that the implementation of revised liver distribution policy occur no sooner than three months from the pending implementation of a new National Liver Review Board (NLRB), which is scheduled to occur in early 2019. Also, upon NRLB implementation, the committee recommended that standardized exception scores for liver candidates be capped at 28, so that candidates with these scores would not outgain priority for urgent candidates based on calculated MELD/PELD scores. Transplant hospitals, using their medical judgment, may request exception scores higher than 28 from the NLRB for individual candidates. Simulation modeling of the proposed changes indicate they would reduce variation in transplants by MELD score that exist in various areas of the country under the current liver distribution system. Modeling further predicts that the changes should reduce pre-transplant deaths and increase access for liver transplant candidates younger than age 18. In addition to modeling results, the committee reviewed opinions, recommendations and questions from more than 1,200 public comments submitted between Oct. 8 and Nov. 1. Richmond, VA – United Network for Organ Sharing (UNOS) has again won a competitive federal contract to serve as the nation’s Organ Procurement and Transplantation Network (OPTN). UNOS has fulfilled this role since the OPTN began in 1986, under contract with the Health Resources and Services Administration of the U.S. Department of Health and Human Services (HHS). Last year, the number of organ transplants in the United States reached a new high for the fifth consecutive year, and the number of transplants is expected to exceed 36,000 in 2018. Including option years, the new contract will run through September 2023. Total funding over the length of the contract is estimated to be nearly $250 million. The federal government will fund approximately 10 percent of that amount. The remainder of contract funding comes from fees assessed to individual member institutions. UNOS is based in downtown Richmond, Va. UNOS is also the home of the National Donor Memorial to honor the spirit and the legacy of organ and tissue donors.